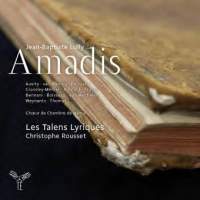 Quinault’s libretto for Amadis de Gaule (1684) adapts a medieval Spanish tale of a hero who loves the British princess Oriane, but they both have to contend with the vengeful assaults of their sorcerous enemies Arcabonne and Arcalaüs, whose brother Ardan Canile was slain by Amadis – although Arcabonne becomes compromised by her hopeless love for the hero who once saved her life anonymously. Christophe Rousset directs from the harpsichord with rhythmical zest and contrasting shades of light and dark, such as the ebbing and flowing contours of tripping solo airs and cheerful choruses in the prologue which compares Louis XIV to a reincarnated Amadis (on account of his chivalry, valour and faithfulness as a lover, obviously). In Act 1, Judith van Wanroij’s agitated Oriane is quick to falsely suspect Amadis of infidelity prior to a bellicose divertissement presenting a knightly tournament (featuring thrilling trumpets and swaggering timpani); but her most breathtaking moment is the centrepiece of Act 4 when Amadis appears to be dead and she yearns to follow him (‘Il m’appelle; je le vais suivre’). Two outstanding monologue airs are in Act 2, set in a forest: Ingrid Perruche’s histrionic Arcabonne admits her lovesickness for the unknown hero who once saved her life in ‘Amour que veux-tu de moi?’; a few scenes later, the title-hero’s attempt to conceal his melancholy in the shadows of the trees in ‘Bois épais, redouble ton ombre’ is sung ardently by Cyril Auvity. Powerful projection better suits Edwin Crossley-Mercer’s dark sorcerer Arcalaüs; after he summons his infernal demons to fight Amadis, a divertissement conveys how they fail to overcome the hero in combat but then bewitch him by disguising themselves as nymphs and shepherds singing a pastoral hymn to love. A quickfire series of set pieces in Act 3 includes a chorus counterpointing doleful prisoners with their cruel demonic captors (‘Ciel! finissez nos peines’), the arrival of the haughty Arcabonne on a dragon (difficult to illustrate in concert) and an astonishing orchestral recitative for the apparition of the ghost of Ardan Canile to prophesy his sister’s doom (sung solemnly by Pierrick Boisseau). Les Talens Lyriques’ expertly played grand chaconne at the opera’s conclusion is another fine testament to Rousset’s Lulliste fascination.